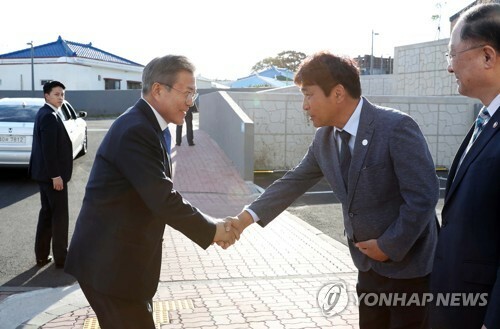 SEOUL, Oct. 11 (Yonhap) — President Moon Jae-in on Thursday expressed “deep regret” over the dispute over the building of a naval base on South Korea’s southern resort island of Jeju in a move widely seen as the first apology by a sitting president. South Korea selected Gangjeong, a small fishing town on the island’s southern coast, as the site for its naval base in 2007 when Moon was chief of staff for liberal President Roh Moo-hyun. The project touched off angry protests from village residents and activists on the ground that the base could set off a regional arms race and damage the island’s environment. The construction of the Jeju base was completed in 2016. “There should be procedural and democratic legitimacy even in a matter of national security, but it was not the case,” Moon said.